Scroll through the order form and exchange list for current Barter for Art Options. 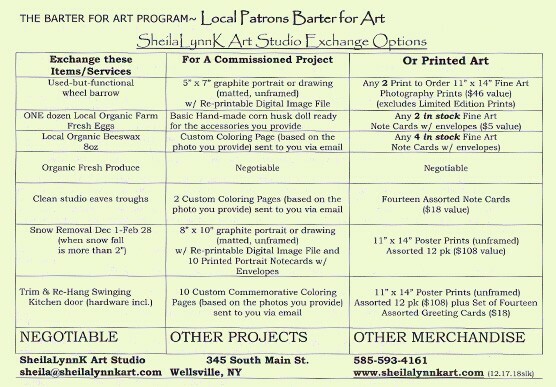 The Barter For Art Program at SheilaLynnK Art Studio launched in February 2014. This idea began with the basic idea of wanting to keep art affordable. A simple Henry Miller quote shared by Lisa Sonora during the Root: 30 Day Journal Project seemed to give the boost I needed to implement this plan. Local patrons are invited to exchange goods and services for art. BECOME A PATRON ~Get Rewards~MORE ART FOR YOU! This is a ONE Time charge for individuals who would like to Support the Art being Made here. This payment option is intended for those who are not interested in a long term subscription or commitment at this time. This payment is NOT tax-deductible and is NOT linked to the Rewards or Terms of any Patreon Subscriptions. If you would like to make a Tax-deductible contribution to Charitable Art Projects and Events at SheilaLynnK Art Studio, you can find out more about that HERE.